If you’re searching for tips on how to start running, you’re in the right place. These are five easy steps that helped me start running and can help you too. When I was growing up, I never once considered myself a runner. I was an athlete. There are running shirts out there that say, “my sport is your sport’s punishment,” and I was one of those people who seriously thought of running as punishment for missing serves in a volleyball game or as a way to get in better shape to be able to get up and down the basketball court. After I graduated from high school and sports weren’t a part of my everyday life, I realized that I needed to figure out something else to do to stay healthy. So I started running and ran regularly for the past ten years, right up until I got pregnant with my almost two-year son. It’s been two years and it’s time for me to start running again. And I know I’m not the only one with the goal to start running. So today I’m sharing five things that will help you get started running, even if you’ve never considered or imagined yourself a runner. I know I didn’t, and I now have over 15 half-marathons + one marathon under my belt. And while I would still choose a pickup volleyball game over a run any day, I love what running does for my body and how it clears my mind. So let’s get to it. 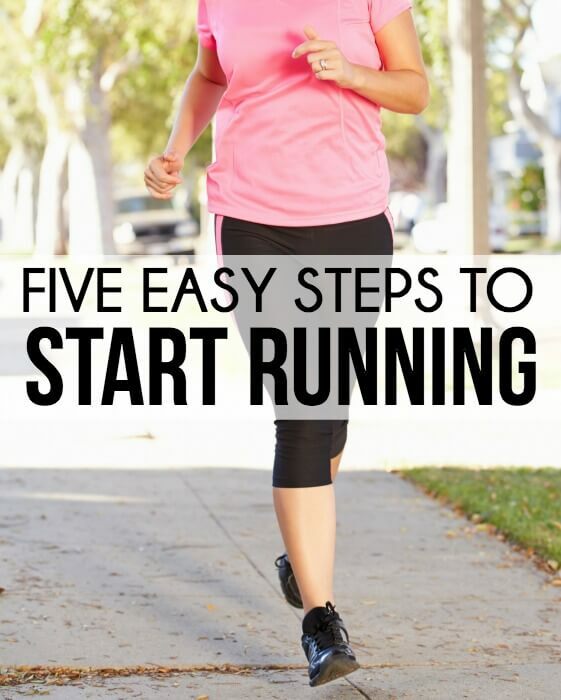 How to start running in five easy steps. I’m putting this first because in my opinion this is one of the top reasons that people stop running before they’ve really even started. Running in the wrong shoes hurts. I know running shoes can be fairly expensive, but the right shoes can make all the difference in whether running is a good experience or a painful one. I highly recommend going to an actual running store, having someone watch you run (it’s a little embarrassing but worth it), and get their recommendations for shoes that fit your running style, pronation, etc. Then run in those shoes. Don’t run in shoes made for crossfit or basketball shoes or any other tennis shoes. Just because they have laces doesn’t mean they’re right for running. Running shoes are right for running. I love running to music. Some people don’t, but those are often people that love running in the first place. They’re not the ones who are trying to convince themselves to run each day like me. Good music does two things — it distracts you from the fact that you’re running because you’re listening to the music instead, and it actually physically makes your body want to move. Or at least it does to me. When you’re on mile twelve of a half-marathon and your legs are on fire, a good couple of songs can get you through that last 1.1 miles. This is a great running playlist to start with. And if that list isn’t enough, check out this playlist of some of my new favorite workout songs. Add your own personal favorites and just get out there and enjoy the music. Unless you are already in amazing shape, starting slow is going to be your best bet. There are tons of couch to 5K programs that will tell you exactly what to do in terms of training to go from not running at all to running a 5K in just eight weeks. If you don’t want to do one of those programs, take your own training slowly. Start by running a mile or two then gradually add on a little bit at a time until you’ve reached your desired distance. People that get hurt often do it by going out and running five miles when they haven’t run once in the past five years. Or by running too often without getting enough rest. Your body will thank you later if you start slow. You’ll be amazed how much you sweat when you run. And while you might not feel thirsty, it’s important to keep drinking fluids to avoid dehydration, especially as you start running longer distances. Drink water before, during, and after your run to avoid dehydration. Last but not least, just do it. 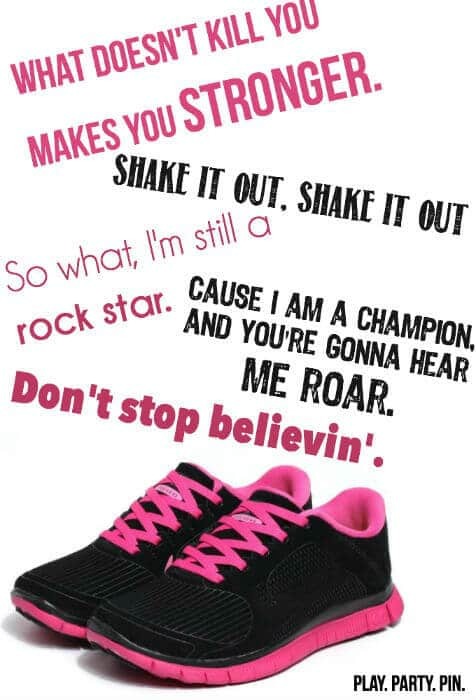 Just start running. I was scared to death when I first started running that I would be terrible at it or wouldn’t be able to run more than a mile. But guess what, I wasn’t. I was actually amazed to see how well my body adapted to running, and slowly the thirty seconds of jogging became thirty minutes of jogging and then 13.1 miles. One of my favorite books about running is Born to Run and one of the things it talks about is how when we’re kids, our playing is full of running. Look at games like tag and red rover; they are literally just different forms of running. We are born to run; our bodies are created to run, and I completely believe that after seeing my little boy run and run all day long until he’s too exhausted to run straight. Just because you got older doesn’t mean your body forgot how to run. So get some good shoes, some good tunes, your water bottle, and just go run. And then run again. And again. And that my friends is how you start running, or at least how I did. I’m starting my next half-marathon training next week and will be writing updates regularly about my favorite running workouts, the best running music, and great half-marathon training advice. Sign up for my email newsletter to keep up to date with all of my running adventures. Sign up now. I need to get in gear …. I think I will put together a playlist tomorrow! Great tips! I always seem to purchase the perfect shoes and I just wear them around the house. I really need to get myself in gear and do it! Thank you. What a great intro to running for someone who might be thinking of starting or going back to it after a long absence. Great tips. Hi Britni! Love these tips. Sharing on FB today. Thanks. These are such great tips! I always want to start running but it ends up hurting my back (I don’t have enough curve in my lower spine to sustain much pressure) but I do love to speed walk. HAHA Bryan is a HUGE runner though.